Harriet Carter Wednesday: How Do I Look at That Special Place Near My Privates? Happy Harriet Carter Wednesday and Day After Election Day! Did Newt Gingrich win? I haven’t checked the newspaper yet. As we roll into November the Harriet Carter catalog has come out with some real winners. This week Harriet helps us see the inside of our ears (but I want to see other places), dresses you up with all that extra money you don’t have, and forgets a few important thing to put into the ladies tool box. Haha box. Let’s go! Product # 1 – Hey folks! Ever wondered what the inside of your ear looks like? 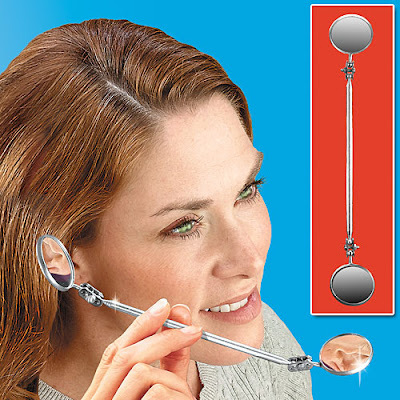 Ever wished there was a mirror that clips to your ear that has a two mirrors attached to it? Well today is your lucky and waxy day! Now you can see just how gross you are each and every morning. What a treat. I hope you can see your brain this way. I, on the other hand, am holding out until Harriet comes out with some sort of contraption that allows me to see that special area between my Mr Winky and my bum. I know that something exists down there, I just don’t know what. I imagine it’s like a hidden rainforest that has all sorts of magical growings that contain herbal remedies that can cure horrible diseases. The point is, is that I know that my special hidden place can help people and, well, I just basically wanna see it. I hope to one day look back and tell tales to my grandchildren about how their grandfather used to have to try to balance himself on the bathroom sink while performing a “downward dog” position whilst using a flashlight and hooked up to some sort of rope/pulley system from the ceiling just to try and sneak a peek. If they can put a man on the moon, surely, they can invent something to help us all see our own unique tropical rainforest. Keep the dream alive. I’m going to drink bleach now. Thanks, Harriet, for pushing the limits of science and technology. Product # 2 – Please, what economic troubles? I don’t know what everyone is complaining about. Oh, boo hoo, I lost my job. Oh, boo hoo, my 401K is gone. Oh, boo hoo, I don’t have food. Complain to someone who cares. Everything is fine. And to prove it I’m going to parade around town in my very own Harriet Carter Money Shirt! That’s right, friends, those are indeed $10 dollar bills you see me flashing. 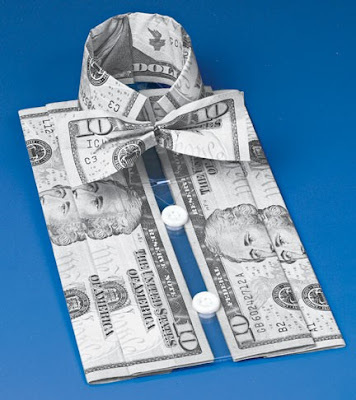 No, I’m not the President, I’m just an average guy….an average guy who can afford the luxuries of shirts made of out US dollars. Jealous? Just to rub it in poor peoples faces I plan on wearing this shirt out and doing the following: (1) Heading down the the unemployment line and asking people what they’re in line for. (2) Waiting in line at the local soup kitchen on Wednesday night and asking if they have French Onion soup. When they say “no” I’ll roll my eyes and state that I’m going to get a steak instead. (3) Head down to the park and ask the homeless people for some spare change because I’m trying to make cuff-links for my money shirt. I mean, when you think about all of this the possibilities really are endless. Thanks, Harriet, for finally adding meaning into my life! Product # 3 – Oh look, “women” are trying to help out and fix things too. Isn’t that cute. Luckily Harriet Carter made sure that the ladies tools are all pink because girls like pink and pink means it’s for girls. It’s like Barbie became a lesbian. 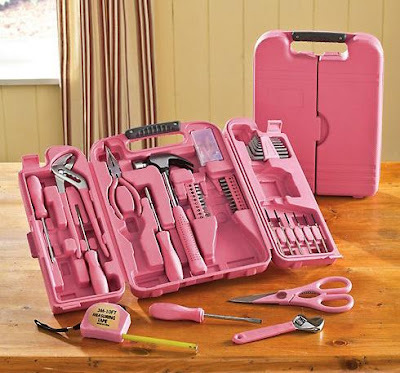 You know, though, if this really is catering towards the female audience I do believe this tool box (haha, box) is missing a few important items that some women would need. For example, where’s the sewing machine? Any room for some spatulas? Is there a compartment somewhere in there where she can store her towels after she’s folded them all? Where’s the space where she can put some tissues since women tend to cry a lot? If we remove some of the screwdrivers I’m sure we could fit at least 3 or 4 tampons in there, but am having a hard time finding the space for the maxi pads. I mean, what if it’s a heavy flow month? You just can’t always know that in advance. I also think that the feather duster will get all of the other tools in there dusty, but I think it’s worth adding to the tool box. Finally, perhaps get rid of those drill bits to make room for the lipsticks, nail polish, and other makeup crap. Oh, and add a couple of extra pencils because I hear that women need to practice extra hard on their math since they aren’t so good at it. Thanks, Harriet, for bringing the women’s movement back about 62 years. Ole!